The five Great Lakes, their connecting channels, and the St. Lawrence River form one of the longest deep draft navigation systems in the world. This bi-national waterway is a critical foundation of the region’s economy for more than 200 years. In a time before railroads and highways, the Great Lakes and St. Lawrence River served as the primary transportation system. Many of North America’s largest cities were established along the waterway as commerce flourished between their ports. 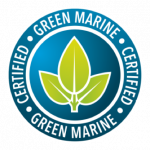 Today, Great Lakes-Seaway shipping is equally important. Each year more than 160 million tons of waterborne cargo is transported within the region or to overseas destinations. 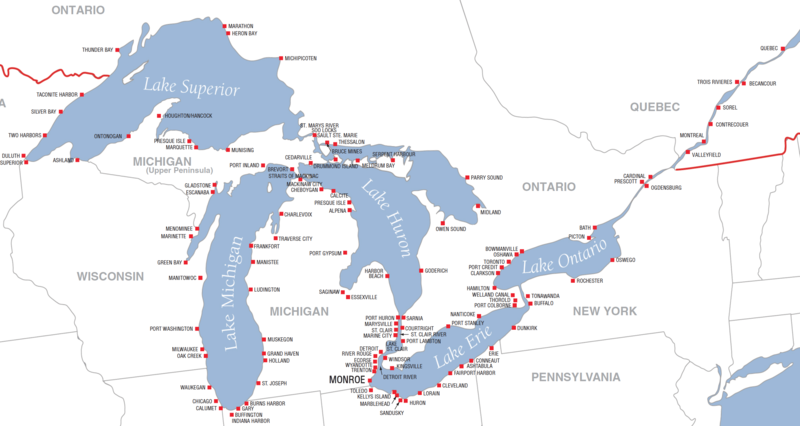 The five Great Lakes form the heart of the waterway. These massive inland seas contain one-fifth of all surface freshwater on planet Earth. Situated between Canada and the United States, four of the five lakes are shared by the two nations. The fifth, Lake Michigan, is entirely within the United States. The waterway flows from west to east. Lake Superior drains into Lake Huron via the St. Mary’s River. Lake Huron drains into Lake Erie via the St. Clair and Detroit Rivers. Lake Erie drains into Lake Ontario via the Niagara River. The entire system flows to the Atlantic Ocean via the St. Lawrence River. As it flows from its westernmost point in Duluth, Minnesota to the Atlantic Ocean, the waterway drops in elevation approximately 600 feet (182 m). While most of the waterway is naturally navigable, the St. Marys, the Niagara and the St. Lawrence rivers were not. Natural obstructions such as rocks, shallow water, dangerous rapids, and waterfalls all had to be tamed, controlled and/or bypassed to enable safe navigation. Massive public works projects have been carried out by both the United States and Canada to construct channels and locks. A navigation lock is effectively a water staircase. The lock chamber is gated on either end. After a ships enters a lock, water is pumped into or out of the chamber, causing the vessel to rise or fall. Once the correct elevation is achieved, the opposite gate opens and the ship exits the chamber. Utilizing lock infrastructure, vessels are able to overcome changes in waterway elevation. The St. Marys Falls Canal and Soo Locks are located at Sault Ste Marie, Michigan and were constructed by the U.S. Army Corps of Engineers. The canal and locks enable ships to bypass rapids on the St. Marys River and safely pass between Lake Superior and Lake Huron, a 21 foot (7 m) elevation change. There are two parallel locks operating at the Soo. The MacArthur Lock is 800 feet (244 m) long, 80 feet (24 m) wide, and 29.5 feet (9 m) deep. The Poe Lock is 1200 feet (366 m) long, 110 feet (34 m) wide, and 32 feet (10 m) deep. The Welland Canal was constructed by the Government of Canada and cuts across the Niagara Peninsula between Port Weller and Port Colborne, Ontario, a distance of 27 miles (43.4 km). The canal includes eight successive navigation locks which lift or lower ships 326.5 feet (99.5 m) from Lake Ontario to Lake Erie, bypassing Niagara Falls. Each Lock chamber is 766 feet (233.5 m) long, 80 feet (24.4 m) wide, and 30 feet (9.14 m) deep. Completed in 1959 by the U.S. and Canadian governments, the canals and locks of the Montreal-Lake Ontario section of the St. Lawrence Seaway enable deep-draft navigation between Montreal and Lake Ontario. This section of the waterway features seven navigation locks – five in Canada and two in the United States. Combined, these locks lift or lower ships 243 feet (74 m). Each lock chamber measures 766 feet (233.5 m) long, 80 feet (24 m) wide, and 30 feet (9.14 m) wide.